Made from .25-inch thick quality acrylic. 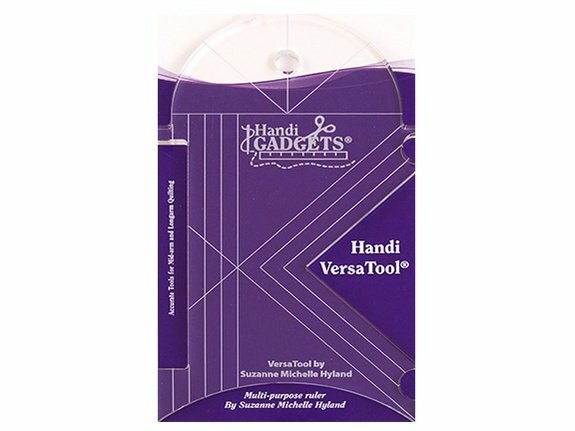 Handi VersaTool created by Suzanne Michelle Hyland is a multi-purpose tool for machine quilters. VersaTool is easy to grasp and designed to fit comfortably in a quilter’s hand. Design uses include: stitch in the ditch 1/4″ outline stitching and crosshatching right angle cut-out for corners – continuous curve quilting – hopping foot notch and gentle curve for outlining applique – full 4-inch curve for circles and clam shells. Packaging includes instructions for use safety tips and design ideas. Use with HQ Ruler Base. Dimensions: 7.5 x 4.5 x .25 in.